The time has arrived for everyone to win. The Three (“tres“) Amigos (“friends”) Walt, Pink, & Mike carpool to the desert, where the spec methylamine buyers wait to get “WHITED OUT (Trademark: Carmen Petaccio 2012 TM).” After a series of stilted self-aggrandizements and an extensive foray into black math profit distribution reasoning (Why would you want 100% of $150 million dollars, when you can have 35% of $250 million dollars?”-W. White, high school chemistry teacher/mathematical wizard), Walt goads the buyer into an a capella rendition of Destiny’s Child’s “Say My Name”. “Say my name,” karaokes Walt. “Say my name. When no one is around you, say baby I love you, if you ain’t runnin’ game.” The genius of this underhanded powerplay is that Walt is the one runnin’ game, the game of swindling the audience into believing that his rival distributors wouldn’t execute him post-haste, the game of the swindled agreeing to their swindling outright, the game of cloying “goddamn rights” segueing to opening credits. BB! Following the aphorism: the stashed methylamine tank is always in the last place you’d expect a megalomaniacal meth cook to stash it. In this case, by last place, I mean the first place, as the first place I would suspect Walter White would stash 1,000 gallons of methylamine would be the loading dock of the monolithic carwash that he owns, but I also wouldn’t zip-tie a crazed polymath to a radiator with two methods of escape within a (free) arm’s reach. Looks like I’ll never make it in the meth logic scene. It’s Visit Your Suicidal Wife at Work Day at White Suds Carwash. Walt & Jesse are visiting Skyler, two rays of meth sunshine poking through her manically depressive raincloud. “Thanks again for the lasagna, Mrs. White,” says Pinkman. “I intend to drink a handle of wiper fluid, as soon as you leave,” says Skyler’s expression. They haul off the methylamine tank and Skyler’s sanity and rendezvous with Mike. Step One of Walt’s Everybody Wins (Dies) Plan is to wave bye, bye to Mike. Step Two is to guilt Jesse into continuing cooking meth via monologues. Step One goes well. Step Two, not as well, later. An extensive montage chronicling Mike’s lawyer friend’s distribution of the hush money ensues. “This is how they get caught,” says the tedious montage. “Actually, the Previously On Breaking Bad said that already,” says I, Carmen. “You’re right like always, Carmen, and so effin handsome,” says the montage. I humbly, reluctantly concur. Hank Skypes with Deputy Lieutenant Who Cares, who informs Hank that Who Care’s Higher Up’s (Who Really Cares) are cutting off his investigation funds, which should have happened roughly three nervous breakdowns and a paralyzing ago. “Wait,” says Hank. “I’ll just solve the case which I haven’t been able to solve at all despite every possible indicator of culpability right now this second.” “Sure,” says us at home. Back to Walt’s Everybody Wins Plan’s Step Two, which goes not so well. “I’m hanging up my indirect child murder boots, once and for all,” says Pinkman. “I’m going to wring Carmen’s heart by extinguishing the glimmer of humanity seemingly behind my calling you a real meth cook in the first scene by revealing that glimmer as a premeditated play for your sympathy. I am as cold as deep space inside,” says Walt. Pink leaves. 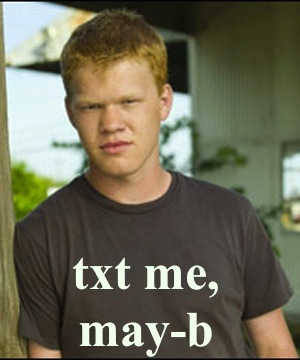 Understanding that the best way to get over someone is to get under somebody else, Walt texts Landry. “Hey, sooooo, me and Jesse just broke up. Want to hang/see Premium Rush with me l8r.” “Deffy Carmen Walt, you’re so effin handsome.” Landry shoots on over, and reveals himself to be better at murdering than meth cooking, a bruising reality all of us must one day sad-face. Hank solves the case, catches Mike’s lawyer in a cake-lollipop snare. Walt & Skyler have a romantic candlelit death pact dinner for two which prompts Walt to decide, quite randomly, to remove his surveillance devices from Hank’s office with his crocodile tears. Coincidentally, Walt happens to overhear Tubbs inform Hank that the lawyer-who quite conveniently wasn’t hush-monied-is narcing on Mike. Mike sits in a park watching his granddaughter swing on a swing. Walt, in a manner befitting a feeling human being, but not, phones Mike to warn him. Mike reluctantly leaves his granddaughter at the park to elude the police and I cry. He gets away, calls Saul-who has opportunely assembled Walt & Pink-and requests his getaway duffel. “I’ll get it and definitely not murder Mike for no reason,” says Walt. Walt meets Mike out in the brush and murders him for no reason. Speculative Next Week on Breaking Bad: Walt admits to Landry he was just using him for meth, Pinkman opens a go-karts and videogames emporium, Skyler kills herself, Hank does nothing for the rest of the show, Walter Junior appears, Marie appears, Molly the baby appears, and Mitt Romney cries for the first time in his life upon learning that Jessica Alba has publicly supported Obama.